Check out what these inmates built in 15 days, it surely beats solitary confinement! 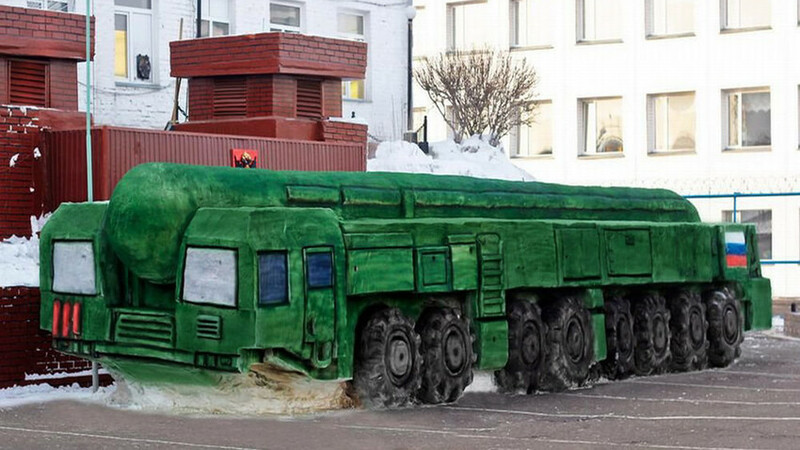 Prisoners in Siberia create realistic ballistic missile snow sculpture. Visitors to the Omsk Region now have another sight to soak up this winter, or at least until the snow melts. Seven prisoners from Corrective Labor Colony No 6 created a sculpture out of the white stuff: An RT-2PM2 Topol-M ballistic missile. As the website of the local Federal Penitentiary Service reports, it took them 15 days to create the artwork, which is just a little smaller than the real thing: 13.5 m long, 3.5 m wide, and more than 2.5 m high. The inmates even managed to color the snow like a Topol-M and decorated it with the Russian flag. In 2017 prisoners from the same colony built a replica of the “Aurora” ship to mark the anniversary of the 1917 Bolshevik Revolution. Want to know more about Russian prisons? Watch this video showing a new luxurious detention center, or find out the meaning behind prison tattoos.